Hi, I'm hoping to join as a social rank. I'm Chris, and I have been playing WoW since about 2007, including a 5 year block from 2009 to 2014. Outside of WoW, I collect video games and vintage computers, repair and modify as much electronics as I am able to get my hands on, and enjoy solving technical problems in general. I have also a keen interest in music, having played the piano for 21 years. I am a Software Developer by profession, though I have studied various other things including Acoustics and network administration. My WoW playtimes are restricted to evenings/weekends due to my work, I am usually on from 7:30-10:30 most nights, and a decent amount of the weekend depending on what I need to do IRL. Heavens Will (Frostwhisper), ~June 2009-March 2010 - My first actually active guild. I raided 10man content, from Naxx up until around Plague/Blood wing was released in Tier 10. I left to pursue 25man raiding. iRaid (Frostwhisper), ~March 2010-April/May 2010 - First 25man Raiding Guild. Was during progress in ICC, This guild started to lose officers and kinda fell apart overnight due to internal trouble. I had just finished my trial when this happened. I left to transfer to a different realm for another guild. Simulacrum (Lightning's Blade, ~May 2010 - May 2010) - I joined this guild to supposedly be part of their new 2nd 25man team, which didn't happen. I got invited to join one of their main raiders in a new guild, which is why I left that. I achieved 10/12N in T10 in this guild. Monkey Tennis/Heavens Fury (Lightning's Blade), ~May 2010 - November 2010 - I joined this guild as mentioned above, and eventually ended up as officer/raid leader, as well as tank/healer recruitment officer. This guild cleared 10/12 heroic in tier 10, but as the late-expansion slowdown happened we lost too many of the core to quitting to continue. The new recruits were not great, the ones who were also burnt out. I also had a period of poor internet connectivity during this time which made things worse. The officers agreed to cease raiding, and I left to try and get the last few bosses of the tier. Archaic Order (Lightning's Blade) ~Nov 2010 - Nov 2010 - This guild stopped raiding for the expansion before I finished my trial period. It did provide some useful experience in Ruby Sanctum 25 Heroic, and Trial of the Grand Crusader 25.
eXodus (Lightning's Blade) ~Nov 2010 - Cataclysm's Release - I joined this guild to attempt to finally kill LK, but the guild only did it once, and I was trial so not in the raid. I did get Herald of the Titans, Tribute to Dedicated Insanity, Ruby Sanctum 10 Heroic, and the ICC 25 Meta achievements before the expansion ended. Edge (Lightning's Blade) ~Dec 2010 - Jan 2012 - This was my cataclysm raiding guild. 10man was the choice, as there was no reason to go for 25 and the logistics involved. It was formed with a few members from Heavens Fury, and we cleared 8/13 Heroic in Tier 11, 6/7 Heroic in Tier 12, and 2/8 Heroic in Tier 13 before other commitments caused the guild to stop raiding. I was Main tank in this guild. Old School (Draenor) ~Jan 2012 - June 2013 - I pushed my way into this guild as a social, due to my knowledge of Paladin tanking at the time, and ended up finishing up the expansion with full clears thanks to openraid and their 25man alt raids (8/8 Heroic Tier 13). I wasn't able to raid early MoP so I turned my attention to twinking, and eventually left as I was more social on other realms. 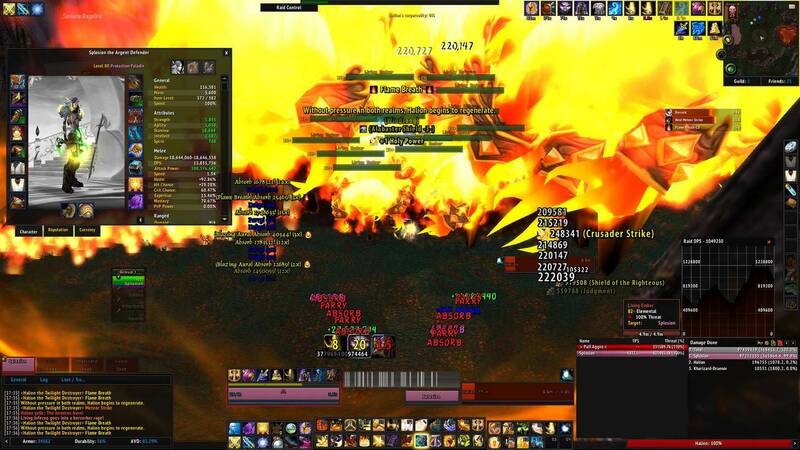 In addition to the above, I also discovered a client-server bug that allowed level 80 paladins (and later max-level tanks on Garrosh then-Heroic, now Mythic) to gain values of vengeance that meant obscene dps (https://i.imgur.com/cmWW10w.jpg Notice the attack power, this was on Halion 25 Heroic. The bug was "fixed" the following week). After Legacy, I have not really had enough time to raid, given work commitments. I still maintain my characters to the best standard that I am able, but my twinks have been the priority as there is no content treadmill for those characters. I've had characters on Thunderhorn since the beginning of MoP, but on alliance. I started at the beginning of legion (pre-nighthold at least) due to IRL friends being on this realm. My current "Main" is an Orc Frost Death Knight, I chose the race because traditionally Orc was the best for plate/melee due to the increased expertise. That is not relevent now, but I still consider blood fury to have good synergy with melee cooldowns. As for Spec, I am frost because it's the most similar to earlier versions of the spec, and a DPS class. I do intend to keep a set, or at least a weapon to be able to play blood and unholy, though I am unsure how much I like the drastic changes the class has undergone since MoP and Cataclysm. I chose Death knight because it interests me, and I had intend to return to WoW to play a melee. The choice on a personal level was between retribution or death knight, and I do intend to level a paladin as well. I have chosen my talents in a way that supports my playstyle, attempting to choose ones that are competetive. I chose Obliteration instead of Breath of Sindragosa as it felt easier to use whilst levelling, and the same is true of Cold Heart vs Icy talons. I wasn't keen initially on using chains of ice as a dps ability, but I will experiment with it. Currently, I get advice from Icy-Veins and the MMO-Champion forums, as it seems that Elitist-Jerks no longer exists. My noteworthy alts are probably not useful at this level, but I can mention them on request. The guild "Redwalker Clan" on Draenor houses almost all of my twinked characters, except my raiding monk (Yuuta) in Legacy on The Maelstrom. I wished for a nice atmosphere social guild, and my IRL friend (his character is Grlock) says that this guild is exactly what I am looking for. I am not a teenager, and tend to feel at home with people closer to my age (28). I am joining with my partner, Lumin. Thank you for your application, an awesome one if i must say.